From the acclaimed author of The Whiskey Rebels and A Conspiracy of Paper comes a superb new historical thriller set in the splendor and squalor of eighteenth-century London. In Benjamin Weaver, David Liss has created one of fiction’s most enthralling characters. The year is 1722. Thief-taker, ex-boxer, “ruffian for hire,” and master of disguise, Weaver finds himself caught in a deadly game of cat and mouse, pitted against Jerome Cobb, a wealthy and mysterious schemer who needs Weaver’s strength and guile for his own dark purposes. Weaver is blackmailed into stealing documents from England’s most heavily guarded estate, the headquarters of the ruthless British East India Company, but the theft of corporate secrets is only the first move in a daring conspiracy within the 18th century’s most powerful corporation. To save his friends and family from Cobb’s reach, Weaver must infiltrate the Company, navigate its warring factions, and uncover a secret plot of corporate rivals, foreign spies and government operatives. With millions of pounds and the security of the nation in the balance, Weaver will find himself in a labyrinth of hidden agendas, daring enemies and unexpected allies. 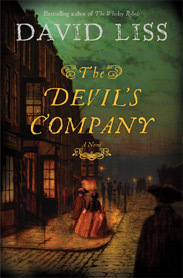 With the explosive action and scrupulous period research that are David Liss’s trademarks, The Devil’s Company depicts the birth of the modern corporation, and is the most impressive achievement yet from an author who continues to set ever higher standards for historical suspense.